This week I ran a session with my project management colleagues, which centered around Cumulative Flow Diagrams and how they can help with tracking projects that use Kanban and lean methodologies. Two standard ways of tracking scrum projects is burn down charts: charts that show teams are performing against the estimated effort in a release; and burn up charts: charts to show how teams are performing against time. The problem with burn down/burn up charts for lean projects, is that they don’t give the full picture and they rely heavily on product owners accepting stories, which doesn’t always happen as regularly as it could, meaning you get an incomplete picture of the progress of the project as a whole. 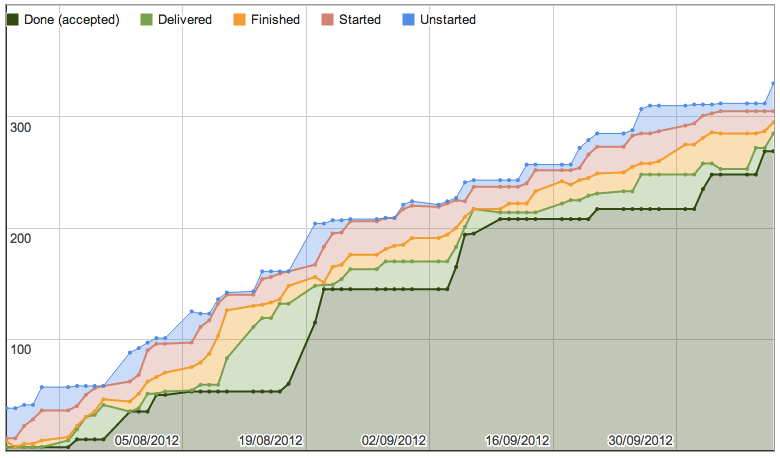 Cumulative Flow Diagrams are a way of visualising and tracking Agile projects in a more holistic way. Using a chart like this can help the delivery team and product owners understand where there are bottlenecks or barriers to delivery, which in turn help scrum masters understand what can be done to make the development process more efficient. Nice post, we recently built a tool that generates burndown charts for pivotal tracker and we are trying to display the best possible metrcis and insights about the project… this post will help us. Looks great! I’m very interested in how you plotted this though. Was the input data coming from the Pivotal Tracker csv export? If so, how did you work around the fact that it does not include the date when tasks changed state to started? Hi Agnieszka as there isn’t an easy way to export the data I needed, I did it a bit manually. I took the Pivotal Tracker cumulative flow diagram and took the figures in the hover overs and added them to google docs.